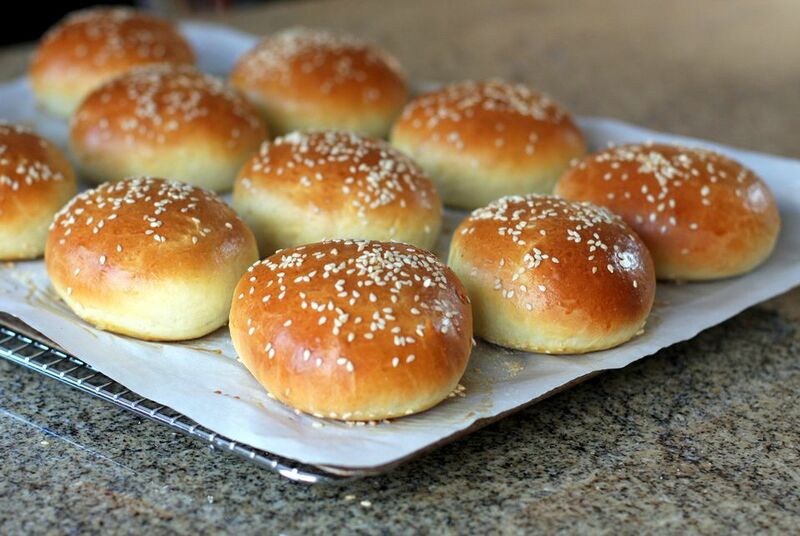 This buttery brioche buns recipe is delicious and the buns result in the perfect rolls for fabulous sandwiches. Bake these brioche buns when you have guests or for a special event. They're perfect for burgers, barbecue, salads, or everyday sandwiches with cold cuts. The dough is quite soft, so mix and knead with a stand mixer and dough hook or bread machine on dough cycle. In the bowl of a stand mixer, combine the milk and yeast. Let stand for 5 minutes. Add the 3/4 cup of flour and the 3 tablespoons of sugar. With the paddle attachment, mix the sponge until you have a smooth batter. Remove the beater, cover the bowl with plastic wrap, and let stand for about 30 minutes or until you see bubbles over the surface of the dough. With the dough hook, mix in the 3 cups plus 2 tablespoons of flour, the salt, and the 4 beaten eggs. Once the dough is formed, knead with the dough hook for about 4 minutes. Scrape the bowl down a few times. Add the butter, 2 tablespoons at a time. Continue kneading with the machine, scraping the bowl from time to time, for about 5 minutes longer. The dough should be smooth and shiny. Oil a large bowl with olive oil or vegetable oil. Using a bowl scraper or spoon, scrape the dough into the oiled bowl. Cover with plastic wrap and let rise for about 1 1/2 hours or until doubled in bulk. Punch the dough down; fold over a few times. Cover with plastic wrap again and let rise for 45 minutes. Transfer the dough to a lightly floured surface. With floured hands, shape into balls. Flour your palm and flatten the balls to make thick disks. Arrange the rolls on the parchment-lined pan. Cover with a lightweight kitchen towel and let them rest for 20 minutes. Sprinkle the tops of the buns with a little cornmeal, then gently turn them over so the cornmeal dusting is on the bottom. Combine one large egg with one tablespoon of water; whisk to blend well. Brush the egg mixture gently over each roll. Sprinkle with sesame seeds or poppy seeds, if desired. Bake for 7 minutes at 400 F.
Reduce the oven temperature to 350 F and bake for 10 to 12 minutes longer until golden brown. Make these in 3-ounce portions to yield about 11 buns. They could be made slightly smaller for an even dozen or even larger if you don't need a large batch.